The first in a series of reports by Circle of Blue and the Wilson Center on the global implications of water, energy, and food challenges in the south Indian state of Tamil Nadu. VILAMBUR, India – The mammoth coal-fired Cheyyur electrical station was first imagined by bankers at India’s Power Finance Corporation and senior engineers across town at the Central Electric Authority. That was in 2005, when the country was rich in fossil fuel resources and desperate for electric power. Though India mined more coal than almost any other country, endemic blackouts and brownouts enfeebled its economic prospects. In the central government’s view, the coastal beaches, mud flats, and palm groves here along the Bay of Bengal seemed a reasonable site for a $2 billion power station. There was plenty of room for mountainous coal piles, towering smokestacks, six giant turbines, water pumps, effluent pipes, coal ash storage ponds, and a new port. The 589-hectare (1,455-acre) plant site included portions of this community and five other isolated farm and fishing villages. National and state authorities were convinced the plant would be an easy sell. 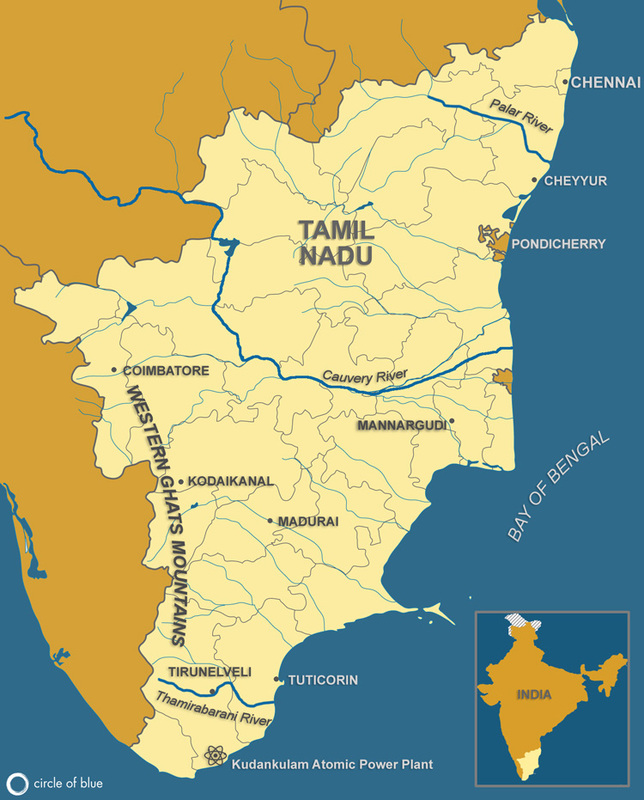 They wanted Cheyyur to be the first of two 4,000-megawatt “Ultra Mega Power Projects” in Tamil Nadu, a beautiful and densely populated southeast coastal state. Fourteen similar plants were planned around the country. Though prodigious in its conception, the Ultra Mega Power Project was not particularly distinctive. It followed international trends of its era. By linking mighty combustion technology to ample pools of domestic and foreign capital, India proposed to build super-sized power plants with the economies of scale needed to compete in the global coal-fired building boom that at the time gripped Asia, South America, and parts of Africa. South Africa was building Kusile and Medupi, two enormous coal-fired power plants, each capable of generating 4,800-megawatts of electrical capacity. China was completing nearly 100 new coal-fired power plants annually. Big coal-fired construction programs were getting started in Mongolia, Turkey, Bangladesh, Indonesia, and the Philippines. Twelve years later, as waves lap against Bay of Bengal beaches and inland farmers cultivate stone fruits and vegetables in Edenic, palm-shaded groves, it is plain that neither Tamil Nadu plant gained traction. Work on 12 other power stations has been suspended. The Ultra Mega Power Project, as originally conceived, is dead in India. It is difficult if not impossible for a single place to embody the full array of emerging factors around climate change, carbon, water, energy financing, culture, and cleaner technology that have utterly changed how India and the world view the value and risks of coal. But if such a place exists, it is in the old and settled villages surrounding Vilambur. Some 3,000 to 4,000 people live here near the wide Bay of Bengal beach and beneath cooling canopies of coconut and palmetto palms. They fish the bay’s shallow near-shore waters, cultivate mangoes and vegetables, and raise cashews and cattle, much as their ancestors have done for 10 generations or more. That pastoral lifestyle is no longer imperiled by a giant power plant. 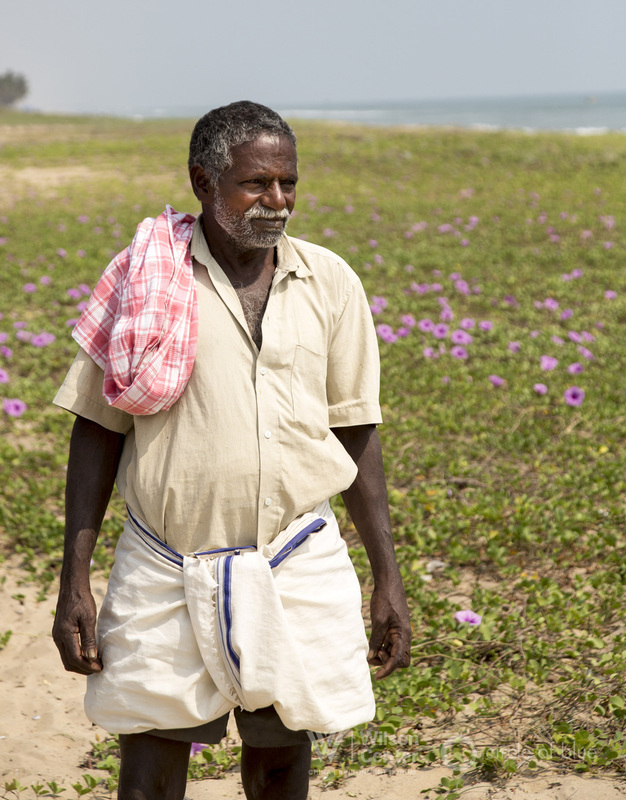 And if a single person can illustrate such a seminal transition, it is Harikrishna, a wiry, thoughtful, and articulate grower who owns a successful four-hectare (10-acre) farm that was threatened by the Cheyyur power plant. A husband, father of three sons, and grandfather, Harikrishna is the prosperous head of a family farming operation entirely in ecological and economic balance with its region. In an outdoor interview graced by fresh coconut milk and raw cashews, Harikrishna explains through an interpreter that he and his neighbors had plenty to defend. Krishna’s family has spent at least 12 generations on the same sandy ground where he and his wife live with two of their three sons, their wives, and two grandchildren. Milk cows wander the yard strewn with dried palm fronds. Fruits and vegetables ripen in the dark furrows of a bountiful garden. Fresh coconuts lie in a green pile awaiting the swipe of a sharp knife. Though much of Tamil Nadu endures a severe drought, a factor in a rash of suicides and heart attacks in other farming regions, Harikrishna’s operation is secure. Two wells provide water for irrigation and the sinks, washbasins, and baths in Harikrishna’s cool and inviting block and stucco home, painted the color of a ripe pink blossom. The geography of conflict and threat that briefly unfolded in Vilambur and neighboring villages tells a much different story than the hardship and sacrifice that dominate so many of the world’s other public interest struggles over water, energy, and infrastructure development. Native Americans organized a huge rally last year to stop the Dakota Access Pipeline in North Dakota, which they view as a threat to their water supply and sacred sites. In South Africa, Pondo tribesman risk their lives to resist a new titanium mine and highway they fear will ruin their agrarian culture. Campesinos died in the northern Peruvian Andes to stop Newmont Mining from developing the $5 billion Conga copper and gold mine which would have wrecked a natural alpine lake. 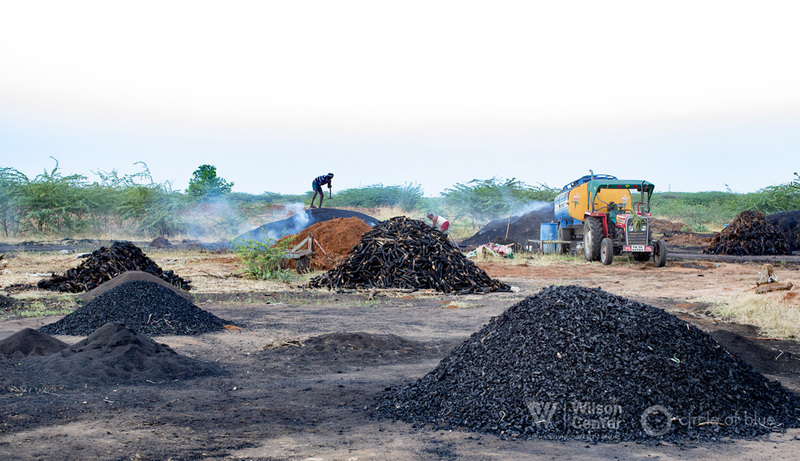 In Tamil Nadu, the Cheyyur mega plant’s opponents were helped by economic and ecological trends that are beginning to close out the age of black fuels, starting with coal. Global coal production peaked in 2013 at 8 billion metric tons and has been falling one to two percent annually in the years since. Coal exports worldwide are declining. Prices are erratic. Public concern about water supply and water and air pollution from big coal-fired power plants has escalated along with construction delays and expenses. If construction started today, the Cheyyur station would cost at least $4-6 billion, according to estimates by energy economists. The Cheyyur plant, designed to be cooled by seawater, also would have consumed almost 80 million gallons of freshwater a day to operate. New and cleaner fuel sources are becoming mainstream. Electric plants that rely on wind, solar, and small hydropower dams are easier and cheaper to build and operate. Investments worldwide in new generating capacity from water-conserving wind and solar energy reached $286 billion in 2015, twice as much as investments in fossil fuel-generated electricity, according to a study by the United Nations Environment Program. At the frontlines, the global pivot away from coal has been much swifter than almost anyone predicted. China, the world’s largest coal producer and consumer, has cancelled 300 coal-fired power plants in the last two years. In the United States, the world’s second-largest producer, coal production fell to 739 million tons last year, down from nearly 1.2 billion tons in 2008, according to the U.S. Energy Information Agency. The United States now generates 30 percent of its electricity with coal, down from more than 50 percent a decade ago. The depression in the coal sector is causing momentous economic pain. Most big American coal companies are in bankruptcy and tens of thousands of miners have lost jobs. Billions of dollars in coal reserves are being stranded around the world. Power companies are encountering new impediments in financing coal-fired power plants. Japanese, Chinese, and South Korean financiers have pulled out of three coal-fired projects in Bangladesh. South Africa’s 4,800-megawatt Medupi and Kusile power plants are a decade overdue, more than $24 billion over budget, and may not be finished until the early 2020s, if ever. 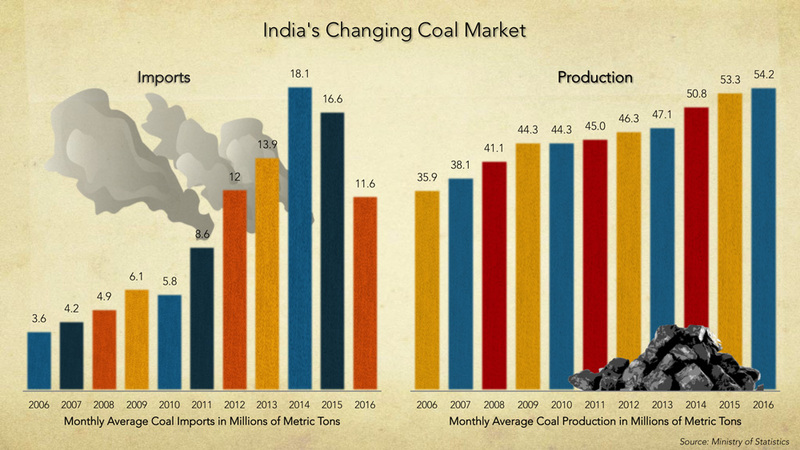 Similar trends are causing turmoil in India’s coal production and combustion sectors. Coal-fired power plants are idle due to lower demand for electricity and inadequate water supplies to cool plants. Coal production is flattening. Coal imports have dropped. Portions of India’s finance sector are reeling as a result. The Reserve Bank of India has reported that the national pool of “non-performing assets,” otherwise known as bad loans, has grown from $8 billion in 2007 to $80 billion in March 2016. Half of the increase occurred from March 2015 to March 2016. The bank estimated that the total value of bad loans could increase another 10 percent by March 2017. The power sector has been responsible for a sizable share of the mess, according to bank officials. Bad loans to fossil energy projects amounted to 11 percent of losses. The Ultra Mega Power Project (UMPP) program reflects the tumult. Of the 16 giant plants that India proposed, just two were built – a 4,000-megawatt station in Gujarat and a second in Madhya Pradesh. Both are hindered by severe operating and financial stresses, along with powerful civic opposition. Last summer, due to lack of interest by developers, the government announced it was cancelling UMPP installations in Chhattisgarh, Karnataka, Maharashtra, and Odisha. The Cheyyur plant never attracted a committed builder. India certainly tried. National leaders marketed the UMPP as a relatively risk-free investment. Limiting carbon emissions to slow climate change was not yet a global priority, and India’s freshwater resources, to process raw coal and cool power stations, were not yet dried up by deep droughts. Coal inside and outside India was inexpensive and profuse. Proven global reserves amounted to nearly 1 trillion metric tons, or a 120-year supply. India also sought to make UMPP plants easier to build than other electric power investments. It changed rules to assure developers that the government would take care of the most difficult details: acquiring land, gaining environmental permits, securing coal contracts, and negotiating favorable pricing agreements. All developers needed to do was put financing packages together for projects anticipated to cost less than $2 billion each and secure guaranteed coal supplies and electricity buyers. Villagers in Vilambur were not nearly as enthusiastic. Farming and a mix of cottage industries and small businesses, including charcoal-makers and concrete block manufacturers, kept rates of unemployment and poverty low. Harikrishna and other farm and fishing leaders recognized that allowing the mega power plant to be built would eliminate their strong local economy, force thousands of people to move, and entirely reshape a magnificent coastal environment and fishery. An opposition campaign formed almost spontaneously. Thousands of people attended the smattering of public meetings held by the state and central governments. Coastal Tamil Nadu Power Ltd., the plant’s curiously uninvolved developer, insisted at each one that the project was safe. The developer also promised local people would be eligible for jobs. But no one outside the government believed it. Countless builders of India’s big industrial projects made similar pledges that never came to fruition. Environmental authorities expressed the same sentiments. They produced compelling reports and testified that the effects of the proposal on inland lakes, rivers, and the sea would be grievous. One well-received study by Community Environmental Monitoring, a non-profit research organization, found that water pollution from the coal storage pile, coal ash waste pile, and from millions of liters of wastewater produced by the plant, much of it heated, would poison surface water reserves and put offshore fisheries in danger. By July 2014, when the study was made public, the pressure and urgency for building mega power projects was visibly deflating. The cost for completing UMPP plants had more than doubled, according to government figures. Prime Minister Modi, and Piyush Goyal, India’s energy minister, announced striking policy shifts to pivot India’s electricity sector to renewable energy sources from more expensive and polluting fossil fuels, a sizable share of which had to be imported. Moreover, the equipment to harvest wind and solar could be made in India. Modi has been more serious than almost any other head of state in promoting a clean energy transition. India doubled the coal tax to $6 a metric ton. Coal tax revenues finance “Green Energy Corridor” projects, which include modernizing the transmission grid and installing solar plants, solar-power water pumping stations, and rooftop solar installations. One of the world’s largest solar power plants opened last year in Tamil Nadu. The world’s largest wind farm outside China is not far away. In 2015, Modi committed India to signing the Paris Agreement and pledged to sharply reduce fossil fuel emissions. In the weeks after Paris, Modi called for generating 175 gigawatts of clean energy electrical capacity by 2022, or 125 more gigawatts than exist today. He joined with several heads of state to form the International Solar Alliance, headquartered in India, to develop and promote solar energy. The policy changes are having their desired effects. The Central Electric Authority declared that India does not need to start construction of any new coal-fired generating plants for at least the next decade. It is difficult for a rural farmer to follow all of the intricate threadwork of India’s new clean energy tapestry. But Harikrishna said he could feel its effects. He and Vinayagam, his 26-year-old middle son, recalled that government and industry personnel were most active in Vilambur and surrounding villages in 2013 and 2014. “I heard they bought some land, but none around here,” said Vinayagam. Then the field representatives stopped coming around. “Nothing has happened, for at least two years, maybe a little bit more,” said Harikrishna. Keith Schneider is senior editor and chief correspondent at Circle of Blue and helped develop the Global Choke Point project. A two-time winner of the George Polk Award and other honors for his work, he also reports on energy, agriculture, the environment, and policy for The New York Times, where he has served as a national correspondent and contributor since 1981. Now, Mr. Piyush Goyal has announced that Cheyyur will be re-packaged as a domestic coal project. But there is many a slip between the cup and lip, and we are hopeful that the slips will prove fatal to the project. Cheyyur deserves to be developed as a water sanctuary and even agriculture has to be re-fashioned to become water sensitive.